Can you believe it is already the LAST full week of October? OH my gee! Where has the time gone? Seriously?! I feel like it has been a busier then normal month for us, and indeed it has with early morning volleyball practices and Saturday games for the girl, working on Fridays each week for me, just to name a few! This is when having a menu plan in hand comes in handy! Do I always follow it? No. But, I do have the ingredients in hand to prepare as listed. THAT says a lot! 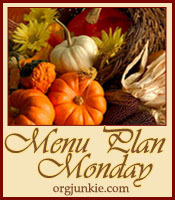 If you are new to menu planning, or just need some inspiration hop on over to Laura's Blog : I'm an organized junkie for Menu Plan Monday. I must prewarn you that you may see some repeats from last week. We simply decided to eat something else a few times, and well.... that's okay!